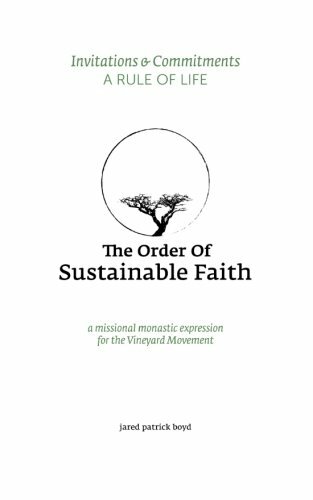 The Order of Sustainable Faith is a missional monastic expression. The Order exists to provide solidarity among those who desire to move more deeply into the contemplative life. Monastic communities and religious orders have always had specific commitments of faith that hold them together. Sometimes these commitments are written down and agreed to in a formal way. Other times, they are commitments expressed in the way of life of a community and a vision for where that life is headed. The Rule of Life for The Order of Sustainable Faith is called Invitations & Commitments. It is now available and ready to be shipped! You can order your copy to the right, or directly from us. Historically, monasticism has taken the form of mendicant orders (Franciscans, Jesuits, Dominicans) and cloistered orders (Benedictines, Cistercians, Carmelites). We seek to take the best of both of these traditions and embody what we can of each. Our Non-Residential Membership is modeled after the mendicant orders, allowing you to live out a set of commitments in the context of your current location. We’ll pair you with a spiritual director and help nurture the conversation. Our Residential Membership seeks to plant intentional communities in both rural and urban contexts. With a commitment to the work of sustainable agriculture, we invite you into a rhythm of life that includes work, study, bodily labor, and sabbath. Monastic communities have always lived in a way that consciously provides a critique of the dominant culture. While we do not currently have a residential expression with OSF, we’re praying that we might grow into this possibility. Beyond postulancy, some members may choose to move to our urban faith community. We are currently in the process of planting a missional monastic and church community on the west side of Columbus, OH in a neighborhood called Franklinton – Franklinton Abbey. At the heart of the Residential Membership is the desire for stability and deepening of one's faith. We live our lives by the rhythms of work and worship, community and solitude, mission and prayer. Each member of The Order of Sustainable Faith begins with postulancy, a six-month period to review the Invitations & Commitments, a Rule of Life for the The Order. Non-Residential Members will meet with a spiritual director to help discern a more extended commitment of 12-18 months beyond postulancy. This additional year, which we call The Novitiate Experience serves to deepen one's understanding of the commitments, as well as one's own self-understanding and motivations for seeking membership in The Order. At the heart of the Non-Residential Membership is the willingness to be where you are– in your city, in your home– and to more intentionally create space for the contemplative and active life. At some point as a non-residential member, you will be encouraged to participate in a 12-month mission somewhere in the world. We want to be mobile in our desire to follow God's leading, wherever that may be. To request an invitation to consider membership in The Order of Sustainable Faith please let us know below. We'll follow up and begin conversation as soon as we are able.